My mom and sister planned to visit me in Nagoya for a few days and my sister ended up arriving a day before my mom, to which she suggested that we use the one free day without our mother around to do all the nerdy stuff we could possibly do--and I guess have some rare sibling bonding in the process. 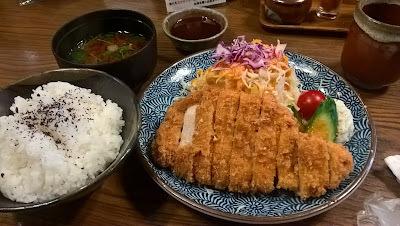 I brainstormed some ideas and decided we had to have some katsu (preferably the Nagoya variety drenched in a dark miso sauce) since my mom is vegetarian. Since my usual hole-in-the-wall haunt was closed on Sundays we opted for a more well-known restaurant not far from my house called Hirono. The restaurant has four different buildings all along the same street, each with its own culinary theme: Nagoya specialties Kishimen(a wide, thin noodle soup) and Tenmusu (rice balls with fried shrimp) in one, Katsu of all kinds in another, one serving sandwiches and coffee, and one serving Japanese style eel dishes. Each is in a chic, old style building with a wooden interior that gave it a really cozy, retro atmosphere. While it still doesn't beat the greasy little cutlet eatery I wanted to go to, the portion was huge and well worth the trip. It's probably not a big tourist stop because of its location in an otherwise quiet student neighborhood near Kawana station, but it's definitely great to get good quality Nagoya local food in a neat little corner of the city that isn't overrun by tourists. Definitely a neat trip off the beaten path. We walked off the big lunch and had to stop by the Book-Off on the way back to my house where--my sister promised to buy me a CD or two as a present. In every record store, there is always that one CD or record in a store that I've had my eye on for months, that I want but for some reason never purchase, a disc that has been there for as long as I can remember and when I visit the store I always pay it a visit to see if it's still there waiting for me. Now was the time to finally take home the treasure that I had checked up on so often at this particular Book Off. In the aisles of J-Pop CDs, nestled in between the sparsely populated rows dedicated to game music was the soundtrack to to the shooter Metal Black. The CD suddenly appeared in the video game soundtracks section one day and immediately caught my eye. Not only do I love this shooter but the cover art made it hard to put down when I first spotted it. Yet somehow it still ended up waiting there for me for months on the shelf and each time I passed by this location I contemplating whether or not I should finally take it home. If you aren't already familiar with Metal Black, it's a shmup that feels like a dark, depressing version of Darius if the creators favorite film was 2001: A Space Odyssey. Copies of the Saturn version, an excellent port of the arcade version, are a little pricey, but if you're in the US you can play the game on the Taito Legends 2 compilation for the PS2 and Xbox. The game itself is often lauded for its visuals, delivering some of the most impressive animations you will see on a shmup from this era, and is a pretty immersive shmup that emphasizes stage design and graphics over complicated scoring and play styles. Still, it poses quite a challenge towards the end and things can get quite frantic. But even if you aren't a fan of shmups and aren't up to the challenge (see: frustration) of grinding through the seemingly undodgeable bullet storms at the ending of the game, Metal Black has an ending sequence so bizarre and surreal that I recommend anyone try at least once to see the end. It's a cinematic-level tour de force I won't soon forget. The music for the game is definitely part of the immersive experience and fits the stages nicely. The post apocalyptic wasteland that you are first transported to in the first stage really pairs well with the equally eerie and sort of unsettling sounds. As the Metal Black travels deeper into the nether regions of the cosmos, the music takes on a darker tone just as the enemies and environments become more outer worldly and foreign. The tracks for the first few stages are infectious and really stick, and I found myself going back to the themes for Level 2 quite often. Unfortunately, outside the two gorgeous illustrations on the front and back of the CD there really isn't much more in the package. They do, however, give you the musical score to the first stage music just in case you wanted to recreate it on your own. How thoughtful! The soundtrack to Metal Black hasn't seen a release on vinyl yet, but the song "Area 26-10" from stage 3, was included on the compilation Diggin' In The Carts, to accompany the documentary film of the same name. It's one of my favorite tracks from the OST, too. In the meantime, it's the only way to listen to a piece of Metal Black on wax but let's hope for a rendering of this beautiful cover art on a finely printed vinyl jacket sometime in the not-so-distant future. My other pickup needs little introduction: the first Cowboy Bebop soundtrack. I thought twice about picking it up because there wasn't an obi but couldn't complain about the price. I seldom see any of them in stores and always try to pick them up when I have the chance. If only I could find Blue for a good price--I used to own a pirated copy of it way back when. I'm from Guam and I like writing about Japanese Music, Culture, and my trips there. I also enjoy rhythm games and building model kits.